The Nokia 7.1 Plus features a 6.18-inch IPS LCD display with a screen resolution of 1,080 x 2,246 pixels and a pixel density of 403 PPI for an excellent viewing experience. It has Corning Gorilla Glass that protects the screen from minor damage. The device is equipped with a 12MP + 13MP dual rear camera that can click on the best picture under any conditions. The front camera has a resolution of 20MP, which allows for great selfies and helps with high-quality video calls. The device is powered by a 3,500 mAh lithium-ion battery and is sufficient to run the device for extended periods of time. It is equipped with dual SIM slots and supports 4G VoLTE. Other connectivity features provided by the device include Wi-Fi 802.11 b / g / n, Bluetooth v5.0, A-GPS and more. The device provides 64GB of internal storage and can be stored in external memory and can be expanded to 400GB to meet all of your storage needs. 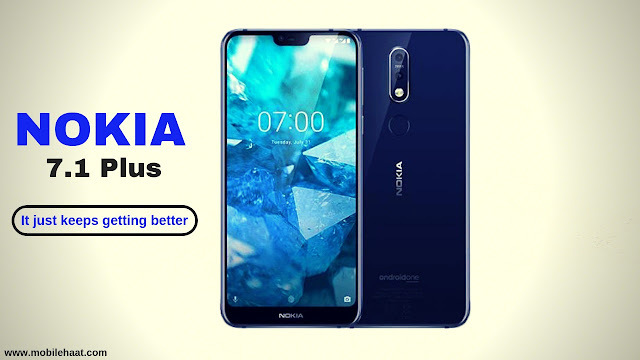 The Nokia 7.1 Plus features a 64-bit eight-core processor setup (2.2GHz dual-core Kryo 360 + 1.7GHz six-core Kryo 360). The entire setup is based on the Qualcomm Snapdragon 710 chipset, with an Adreno 616 graphics card and a 4 GB RAM to keep the device running smoothly. Processor: Octa-core ( Dual core, 2.2 GHz, 1.7 GHz + Kryo 360, Hexa Core, Kryo 360). Graphics Processing Unite (GPU): Adreno 616. Body: 154.8 x 75.7 x 7.9 millimeter. SIM Card Type: Dual SIM, (Nano-SIM, Hybrid). Sensors: Exmor-RS CMOS Sensor, Proximity sensor, Light sensor, Gyroscope, Accelerometer, Compass. Display Resolution: 1080 x 2246 pixels. Display Protection: IPS LCD Capacitive Touchscreen. Colors Available: Red, Silver, Dark Blue, Midnight Black. Camera Resolution (Back): 12 MP + 13 MP Dual Megapixel. Camera Factors (Back): Autofocus, F1.8, Dual-color LED Flash, Image Resolution 4000 x 3000 Pixels, Exposure compensation, ISO control, Continuous Shooting, High Dynamic Range mode (HDR), Digital Zoom, Auto Flash, Face detection, Touch to focus. Camera Resolution (Front): 20 Megapixel, F2.0. Memory Card Slot: MicroSD, up to a massive 400 GB. Battery Type & Performance: Li-ion 3500 mAh, non-removable. Video Recording: 1080 x 2246 pixels. WLAN: Yes, Wi-Fi 802.11, ac/b/g/n, Mobile Hotspot. USB: Mass storage device, USB charging (Doesn`t support micro-USB). Fingerprint Sensor Position - Rear.